There’s not really much more to be said about All My Sons that I didn’t cover in my original review of the play. Howard Davies’ production of Arthur Miller’s classic was a deserved huge success in the West End in 2010 and Digital Theatre captured it on film over two nights in September and so one now has the opportunity to rent it online, or download it to watch via their video player. The fact that the play takes place on the single set lends itself to being captured quite easily on film, there’s little theatrical shenanigans employed here to distract from the fireworks of the acting, that is the real focus of this show. 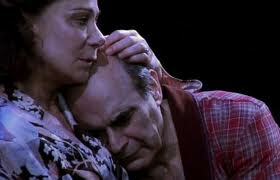 David Suchet’s oily geniality and Zoë Wanamaker’s blind forthrightedness are simply exceptional together as the Kellers play host to family and neighbours and are ultimately left helpless as long-buried truths from the past worm their way to the surface with devastating consequences. I really enjoyed being able to revisit the show as well because it was the first time I had seen it at the Apollo, and so I was able to take in a little more of the story that had passed me by first time round, and really appreciate the growing sense of tragedy about it all, especially knowing what the final destination was. There’s really not a weak link here: Stephen Campbell Moore and Jemima Rooper put in sensational supporting performances, especially considering the weightiness of Suchet and Wanamaker. But what really shines through is the intricate level of detail that one is able to take in with the occasional close ups. The tilt of Wanamaker’s head as she receives news, the fervour of Campbell Moore’s passion as he discovers the truth, the crumpling of Rooper’s face as she is constantly reminded of her family’s history, the energy that seemingly crackles from Suchet’s every pore. There is no way that a recording can capture the magic of live theatre, and nor is it really trying to, but this All My Sons is delightfully close to the real thing.